Many publishers make articles available before they are formally assigned to a volume and issue. These articles reflect the most current research and BrowZine makes these articles easily accessible in our Articles in Press section. In selecting a journal in BrowZine, the most current volume and issue of the journal available to users from their library is displayed. 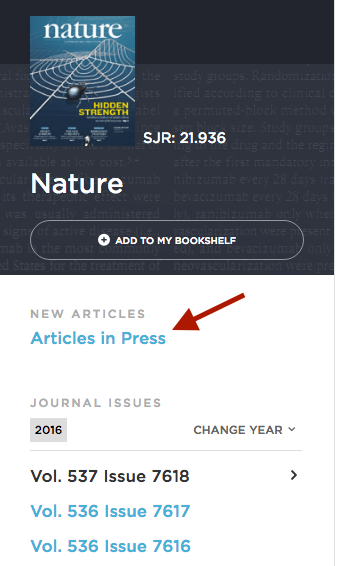 If articles in press are available, users can easily find them in the Articles in Press section! The new article alert feature of My Bookshelf includes Articles In Press, ensuing users get access to all the cutting edge research as soon as it is made available. Once a user marks an Article In Press as "read" it stays that way, so if the article makes its way to a formal issue users are not notified more than once. Additionally, Articles in Press for each journal has a durable URL. For libraries who are interested in linking users directly to the most recent content available from a journal, simply go to the Articles in Press section, then copy and paste the URL as it appears in your browser. Please contact us at info@thirdiron.com if you have any questions about Articles In Press!